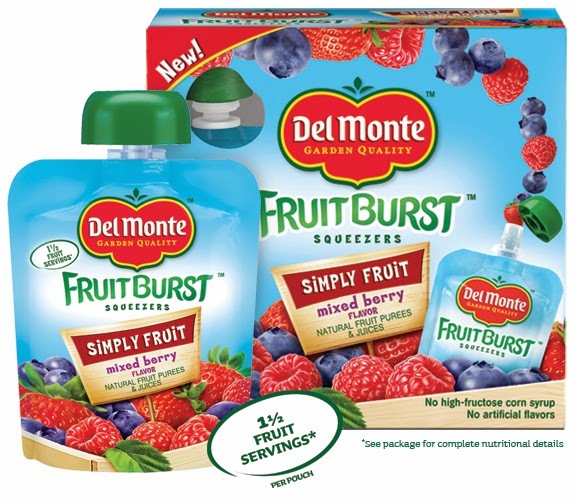 Disclosure: The Del Monte products, information, gift pack, and gift card have been provided by Del Monte. that were nutritious, balanced and had some variety to them. crazy trying to make lots of fancy Bento boxes while 8.5 months pregnant. and we can add them into the lunch rotation. I'm glad to report that they were a big hit! fruity that is put in front of him. hard to find something that suits her picky little palate. I was so excited that she loved the diced mangoes and the Fruit Burst Squeezers. The Fruit Burst™ Squeezers come in a Fruit+Veggie variety or Simply Fruit. daily diet is always awesome. The Fruit+Veggie are available in Peach-Mango or Blueberry Flavor. The Simply Fruit are offered in Apple Cinnamon, Mixed Berry, or Strawberry. These rich and luscious mangos are a healthy way to add a little sweetness to your day - fat-free, cholesterol free, and high in Vitamin C - that you can enjoy anywhere. 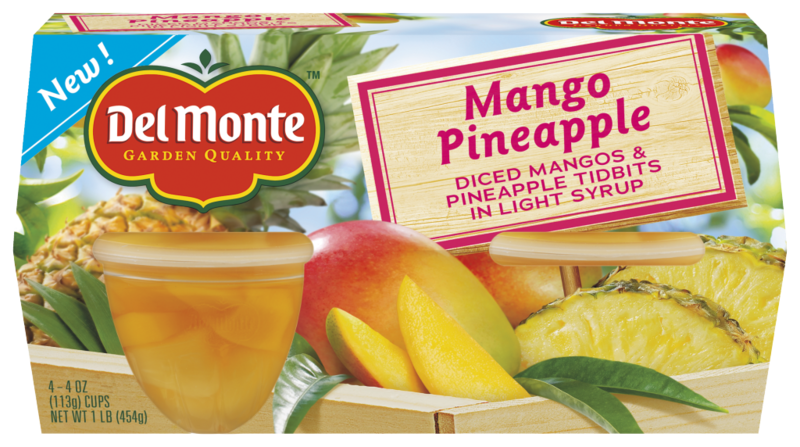 Del Monte® Mango Pineapple Fruit Cup® Snacks combine two of the world’s most popular fruits: mango and pineapple. 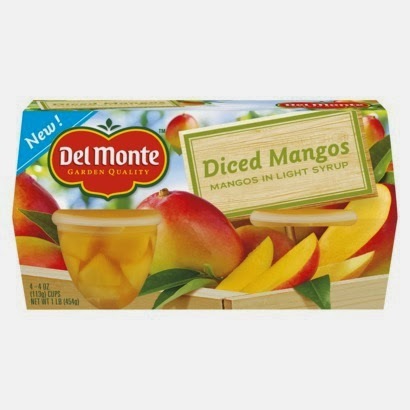 Made with rich and luscious mangos and pineapple, they contain no high fructose corn syrup and are a rich source of vitamin C.
You can find these yummy new Del Monte products at your local Wal-Mart. plus they make the perfect addition to daily school lunches. NOW TIME FOR A GIVEAWAY!!!!! I get to giveaway a $25 Walmart gift card and 2 Del Monte VIP coupons!!!!! Yes, I have 2 picky eaters. I'd like to try the mango pineapple snack cups. Both my kids are picky eaters (i don't know where they got it...) But they will eat the fruit pouches. YES,my son is very picky but it kind of goes along with his autism....some days I wonder if the wind is going to carry him away. He likes the mixed fruit cups. When it comes to fruit, no picky eaters here. We would love Mango Pineapple Fruit Cup. My son is sort of picky, but I think he would love the diced mangoes! i am a picky eater but the mango pineapple sounds awesome!! they would be nice to keep in my desk at work for snack times - rather than sweets! My daughter can be a picky eater. I think she would like the Peach Mango Fruit squeezers because it would be fun for her to eat fruit this way and she would like the peach flavor. No picky eaters here!! Mango Pineapple sounds delicious. My kids are not picky at all and they would love to try the blueberry squeezer. Yes, I have picky eaters! They would love the mixed berry squeezers. My picky eaters love the peaches! Picky is an understatement!! She would like the mixed berry, I think!! My boy would love the mango! My son is randomly picky - but never when it comes to fruit! He'd like the Fruit Burst™ Apple Cinnamon Squeezers for sure. Not picky at all. Elle would like the diced mangos. no picky eaters in my house; the mixed fruit cups or the apple cinnamon squeezers would be a hit with us. my husband is weird about certain textures, but he would love the mandarin oranges, and I would love the ruby red grapefruit! Yes, I have two picky eaters! They would like the peaches in the fruit cups. I have a very picky eater. I am sure she will love any of these products, thankfully. Especially the pineapple and mango fruit cups! They ate anything put in front of them! I think my picky eater would love The Fruit Burst Squeezers. She'd like ngo Fruit Cup® Snacks. Thanks for the giveaway! I'm sure my kiddos would love to try the pineapple mango! I'm not really picky and I would love to try the fruit cups! I don't have a picky eater. My son would like the Mango Pineapple Fruit Cup. I have a VERY picky eater (granted he isn't even two yet!) I would like to try the Mango Pineapple Fruit Cup though. 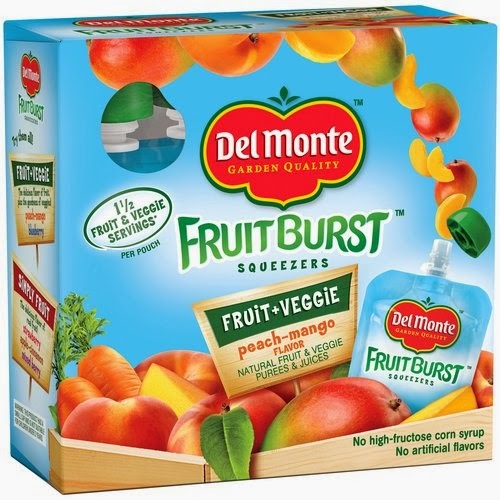 Yes I do have a picky eater at home, he would like to try del monte Fruit Chillers® Frozen Treats, Thank you! Yes, I have a picky eater...she wasn't when she was little, but now she is. She would like the mango pineapple, I think. I do have a picky eater...my grandson. Luckily if you ask him (he's 2 1/2) he'll tell you if he wants it or not --- and if he says yes, he eats it, but ...he doesn't often say yes! yes my niece is a super picky eater.. she will eat the peaches though. My daughter isn't picky, although she prefers her applesauce in a squeezy pouch rather than from a jar :) I know she'd love all the flavors! We would love mango pineapple. My picky eater does love pineapple. No picky eaters, but the mango fruit cups look great!